It’s no secret that Chinese officials enjoy privileges in all aspects of life, but recent research shows these extend to the next generation: New graduates with one or both parents working for the Communist Party receive a 15 percent higher starting salary on average than peers with similar qualifications. 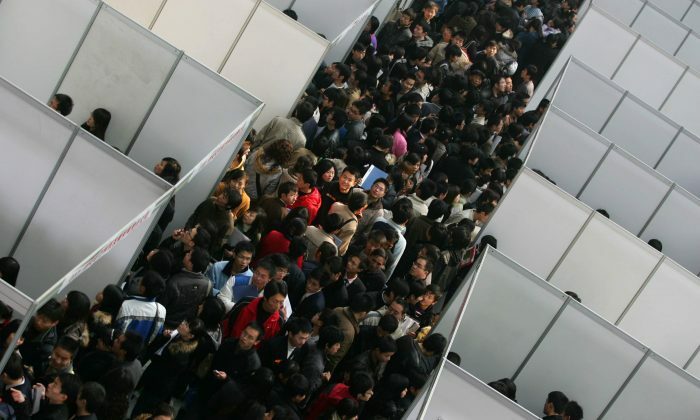 The Tsinghua University study, conducted by surveying over 6,000 new graduates nationwide, also shows that officials’ children are much more likely to land jobs in trendy and lucrative sectors, like finance and government, while those without connections tend to work in less popular industries like mining and construction. Research leader Li Hongbin, deputy director of the China Data Center of Tsinghua University, told Beijing Evening News that parents’ political status greatly impacts graduates’ starting salary beyond any other factor, even student school performance, and parental income and education level. In fact, Li said, top-performing students tend to have lower starting salaries, as those who work hardest are often poorer children who need to earn a scholarship by getting good grades. Similarly, working during college is negatively correlated with income, Li said. Such students are typically from poorer families that can’t afford the tuition and living expenses. In contrast, potential to thrive in the Party system improves the chance of a higher starting salary, for example by joining the Party or Party-affiliated student associations. In recent years, there have been plenty of extreme cases involving officials’ children being given senior positions. Examples include a 22-year-old woman appointed as vice chief of a district Development and Reform Commission, and a 27-year-old man who took over from his father as a county vice governor, when he was promoted to a new position. On popular news site Sina.com, many readers left comments about the study, sharing their personal experiences of officials abusing political power to help their children into the most coveted positions.